WONDERBOOM is an entry-level speaker by Ultimate Ears. But, the performance of the speaker is outstanding. Ultimate Ears WONDERBOOM speaker has some amazing features. If you are looking to buy a great speaker with good specifications, then this should make it to your list. The sound outlives above the size of the speaker. Even if you play the speaker loudly, there will not be any kind of disturbance or distortion. The speaker is waterproof so it makes an ideal choice for your pool party. The audio performance will remain the same in any kind of setup, which is simply great. 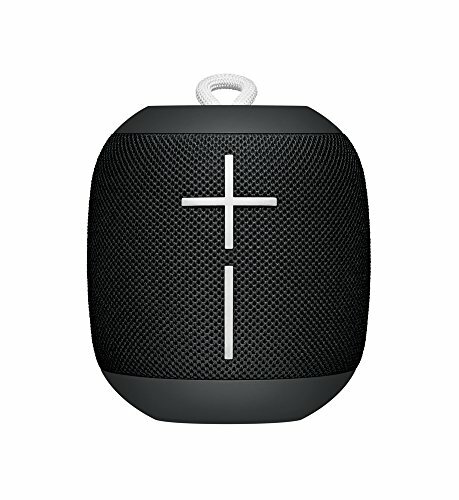 Ultimate Ears WONDERBOOM speaker has multipoint paring so you will not experience any issue in connectivity. In fact, the connectivity of this speaker is good for the kind of range it offers. Up to 100 foot, the sound is clear and loud. It is ideal for your house or lawn parties. The battery performance of the speaker is good but not that great. Given all the features and price, the battery life could have been better. The build and design of this speaker give it an extra edge as compared to other speakers in this range. It’s sturdy and different and it looks good. If you need to buy a speaker for its sound performance, then you must consider this speaker. The speaker delivers amazing audio performance with a 360-degree sound that can light up any party. You can play this along in any setup. The speaker is waterproof and it makes an ideal choice for your pool parties as well. You can also use the speaker for all your outdoor activities including adventure sports or gym. You will not be disappointed by the sound as its clear in every setup. Even if you play the speaker on highest volume, there will not be any leakage in sound. What sets this speaker apart is the connectivity. The Bluetooth speaker connects and integrates with various devices giving you a great music experience. The speaker is portable and you can carry it along anywhere you go. In fact, this also makes a great choice when traveling. The design and overall setup of the speaker are quite intriguing. If you compare it with other speakers in the similar range, then design wise this is quite different. Due to its design, it’s quite popular amongst teens. It is a very good sounding speaker for the price. The range of the speaker is also good, so you can consider it for its range too. There are many great features of the Ultimate Ears WONDERBOOM speaker, let us look at some of them. Ultimate Ears WONDERBOOM delivers enormous, crisp and clear 360-degree sound so you can enjoy any party or any setup. The sound performance of the speaker is simply amazing. The speaker has great Bluetooth connectivity. You can easily connect to your speaker using Bluetooth and other devices and keep playing up to 100 feet (30M) away. The range of the speaker is good so it is ideal for your house parties. You can play your music safely as the speaker has party IPX7 waterproof feature. It lets you play your music unharmed around water with IPX7-rated waterproofing. This is indeed great for any kind of setup. You can also play it along at a pool to enjoy your music. Ultimate Ears WONDERBOOM speaker gives 10 hours of battery playback and that is again great for the price it offers. The battery life is not so amazing but still, you can manage, as the sound quality of the speaker is good. A single charge can give you 10 hours of playback and charging is also simple. The speaker has a special double boom button on the front that lets you connect with other devices. In fact, you can play along with several devices at a time. You can play the music loud and clear with this amazing feature. The bass performance is well balanced and there is no distortion. Ultimate Ears WONDERBOOM speaker offers easy controls. You can play, pause or skip any song with the touch of a button. The UE button on the top has an easy interface. This actually saves a lot of time. The speaker is virtually indestructible. In fact, the speaker is drop proof tested. Even if you drop the speaker from 5 feet, it won’t break or the sound quality won’t get affected. The speaker can connect up to eight different source devices and two devices at a time. Ultimate Ears WONDERBOOM speaker is compatible with almost all the tablets and smartphones. It has a smart wireless audio profile and these features make it popular in its range. Ultimate Ears WONDERBOOM speaker is amazingly different in the design department. It actually resembles a soda can shape. But, being small in size also the performance of the speaker is great. The design is good with easy interface. There are power and pairing buttons on the top along with UE logo. A mesh fabric makes it more sturdy and durable surrounding the speaker. In fact, the build quality of the speaker is so good that even if you drop it from the height of 5 feet, there will be no damage to the speaker. The build is indeed good and that is the highlight of the speaker. The speaker has an amazing bass so the sound quality is great. The speaker has two active drivers and two passive radiators. The sound won’t leak or distort even when the volume of the speaker is high. Bass levels of the speaker are solid and the sound shines even in the low-frequency range. The mid-frequency sound of the speaker is average. The high-frequency sound of the speaker is also good and you will not be disappointed when you play your tracks at maximum volume. The sound performance is balanced and it has many layers. The overall sound quality is good for the price it offers. The setup of Ultimate Ears WONDERBOOM speaker is amazing and clean. The speaker has a multi-point pairing so there is no issue of connectivity. The power and playback buttons are featured on the top for easy access. It lets you integrate with other devices without any problem. You do not need extra settings for the speaker as it easily integrates with all the devices. The control and setting option are simple so you can access the speaker with the touch of a button. The volume buttons are big so there is no problem with setup. The interface is easy and there are no added controls. Performance wise this speaker scores the highest. You will definitely be impressed with the audio quality of the speaker. The sound is crisp and deep. In fact, the bass base of the speaker is simply amazing. You can hear any kind of music with loud volume and it will not crack up. The performance is also good in the high range. The speaker is compatible with all the Bluetooth devices. In fact, it lets you double up the UE button that helps you with the connection. The speaker is also compatible with different speakers by Ultimate Ears. You can play your music loud and clear. Ultimate Ears WONDERBOOM speaker connects to almost all the Bluetooth devices. There are no added options for wired connectivity though; still, it does not lose any connection while playing your music. Its range is up to 100 feet and that is quite good for the price that it offers. The battery performance of the speaker is good but not that great. It gives you up to 10 hours of playback time with full charge. The charge takes about 50 minutes but it is not drained even if you play continuous music. So, the battery performance is acceptable for specifications it offers. It has a powerful bass base. The battery performance is average. It is a tad bulky. Ultimate Ears WONDERBOOM speaker as an entry-level speaker makes a great buy. And, for the price, the features are simply amazing. The audio quality of the speaker is excellent and it is the main highlight of this speaker. The bass is good even if the volume is high. It can suffer in the low-frequency range, but that is not a major issue for the price. The speakerphone is missing and it can disappoint you a bit. The audio is loud and clear and it plays all the music genres. Being water resistant, you can carry the speaker outdoors or while traveling too. The looks are stylish, the interface of the speaker is also neat, and this is again an advantage. It’s indeed a great buy for the all the music fanatics.